With quite a bit of steak leftover from dinner last night, I am composing it into a simple salad for dinner tonight. Not only do I have leftover steaks, but I also have half a pan of these yummy treats. Cue the easy Sunday dinner for me! 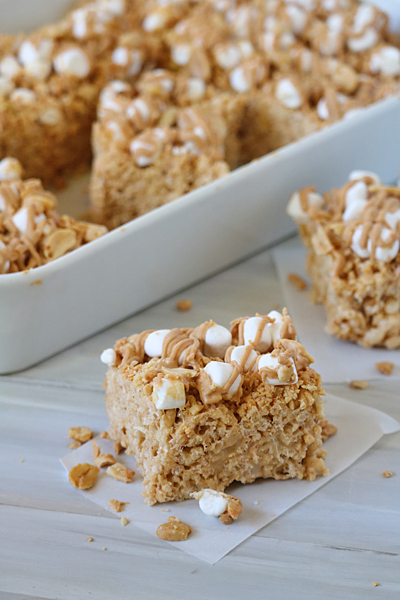 These treats are the love child of a traditional Rice Krispies treat and the classic New England sandwich made with peanut butter and marshmallow fluff. There's the obvious sticky, gooey, crunchy texture of the traditional recipe, but then there is the salty and nutty flavor from the trio of peanut butter chips, peanut butter, and chopped peanuts. The recipe calls for an 8-inch square pan, but you can easily double the recipe and press the mixture into a 9-x13-inch rectangular pan, as I did last night. Spray an 8-inch square baking pan with non-stick spray; set aside. Spray a large bowl with non-stick spray. Add the Rice Krispies cereal and chopped peanuts to the bowl; set aside. In a large non-stick pan, melt the butter over low heat. Add the marshmallows, 1/2 cup peanut butter chips, salt and cook, stirring constantly, until melted and smooth, about 8 minutes. Add the vanilla. Pour the mixture over the cereal and peanuts and mix until incorporated. Press the mixture evenly into the prepared baking pan. Allow to cool for 15 minutes. In a small bowl, combine the remaining 1/2 cup peanut butter chips and creamy peanut butter. Melt in the microwave until smooth. Sprinkle the top of the treats with 3/4 cup mini-marshmallows. Drizzle the melted peanut butter mixture over top. Allow to cool until the peanut butter drizzle has set, about 1 hour. Cut into squares and serve. Enjoy! So perfect and a great reminder that Sunday supper doesn't have to be hard and involved, just comforting. My family would love this!!! So,so happy to have this site to inspire my Sunday family suppers!! It is my pleasure to share our menus with you!